The team at Mamacita's Cafe. Doughnuts are best served on a stick, especially when there’s a sticky glaze involved. It just makes cleanup a whole lot easier. In Uptown Oakland, Mamacitas Cafe dips its bite-sized puffs of fried dough in a variety of sticky, flavored glazes — the bold, assertive cardamom glaze, for instance. Another excellent choice has apricot jam tucked inside and a salted vanilla glaze covering its surface. But the best part? 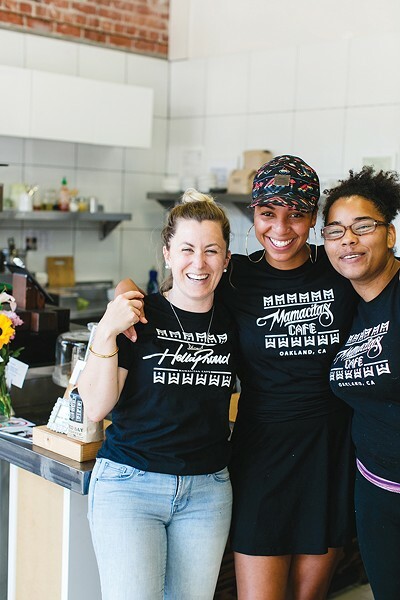 Buying these doughnuts will make you feel good about yourself in more ways than one because Mamacitas Cafe’s has built its socially-conscious business model around hiring young women in Oakland and providing them with leadership training. So, in a very real way, every time you eat one of these donut kebabs, you’re also supporting the local community. — C.M. Juana Ojeda, the chef-owner of the Cal-Mexican taqueria Aztecali, says the process of making her pozole verde is so time-consuming that she’s only able to serve it once a month, on the third Sunday. It’s for good reason, then, that regulars plan their whole schedule around the availability of that one dish: In the hierarchy of Mexican hominy stews that you can find in the East Bay, Aztecali’s version is quite possibly the best of the best. I love everything about this soup: the soul-warming quality of the slow-simmered chicken broth, the tangy brightness of the pumpkin seed-based mole verde, and the toothsome bite of the purple-pink hominy. Cursed be those second and fourth Sundays of the month, when a slight misreading of the calendar has prompted me, on several occasions, to step up to the counter only to discover — insert Crying Jordan face — that there was no pozole to be gotten. It’s a good thing all of the other food at Aztecali, from the expertly constructed tortas to Cotija-dusted chicken tinga tostada, is pretty uniformly delightful. — L.T. 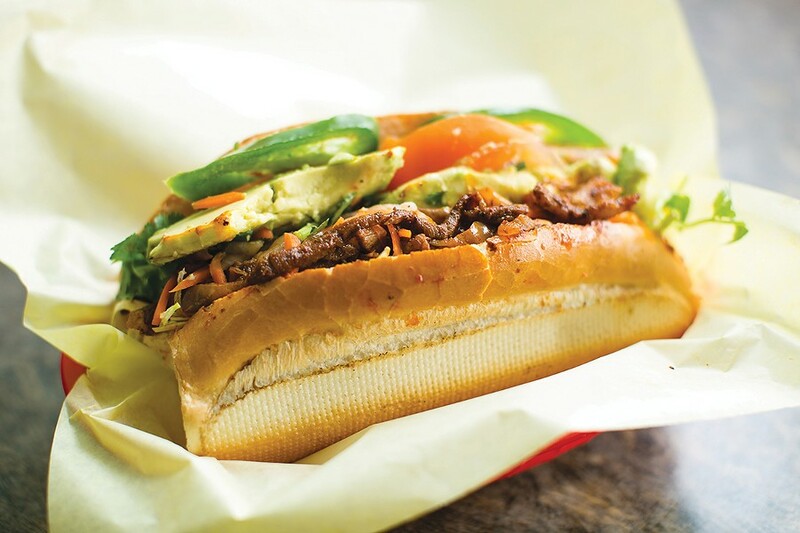 Best Cross-Cultural Mashup in Sandwich Form: Al Pastor Banh Mi. There might not be a more charming restaurant in Oakland than this combination taqueria and banh mi shop — a uniquely Oakland-ish partnership that resulted when the respective owners of each business decided to join forces in 2011. Regular customers might debate whether the Vietnamese offerings or the Mexican offerings are the star attraction — whether Saigon Deli’s banh cuon trump Taco Valparaiso’s fried fish tacos. But the fact of the matter is that it’s when the two cuisines come together that the restaurant really shines. Case in point: One of the greatest dishes in all of Oakland (all the greater for costing a mere $3.75) is the al pastor banh mi, which takes intensely savory al pastor-style pork and a slow-burning red salsa, and puts it all on a banh mi roll, with the traditional garnishes: cilantro, jalapeño, and sweet pickled daikon and carrot. Who knew? These flavors are just meant to go together. — L.T. Okay, it’s not as though the East Bay has another neighborhood bodega where you can buy annatto-tinged arroz con gandules or pork pasteles fresh out of the steamer. But even in the kind of utopian world where the heady smell of sofrito wafted out from every street corner, I tend to think Borinquen Soul would still stand out. Tucked inside an unassuming convenience store in Oakland’s Dimond District, this food stand specializes in down-home Puerto Rican grandma food — the kind of food that used to be damn near impossible to get in in the Bay. I could wax poetic about the golden-brown sheen of the crisp salt-cod fritters; or the slick of concentrated meat juices that enriches the slow-roasted pork shoulder, which is served every Saturday; or the sofrito-spiked “Borinquen Soul Sauce,” which makes everything on the menu that much more delicious. Really, though, arroz alone is worth the trip — savory, studded with toothsome pigeon peas, and insanely aromatic. Where else in Oakland can you find rice that tastes this good? — L.T. As someone who has long admired adventuresome free spirits, it pained me to realize I am unshakably a creature of habit. But then, who needs flights of fancy when you can have King Tsin’s spicy charred cabbage? Of all the dishes I love on King Tsin’s menu — and there are many — it’s the cabbage I order every time. Yes, there’s the steamed fish fillet that, served over slices of silky soft tofu and under a delicate sauce, tastes like your happiest dim sum dreams. Or the sesame bread, which at King Tsin is less pancake and more savory Sichuan babka, the whorls of soft interior dough hiding pockets of scallions and the crispy, salty exterior coated in sesame seeds. Or the spicy fish fillet, or the wontons with house-made Sichuan chili oil, or the mapo tofu that’s so exceptional it’s even delicious in its vegetarian incarnation, without ground pork. But even with all these, it’s the green cabbage slowly cooking over a flame at the table that turned me into a regular, its crisp leaves wilting and charring and soaking up a sauce less hot-spicy and more mouth-tinglingly-delightful. When a restaurant manager’s greeting is “Cabbage?” and a smile, I figure other people can do the adventuring. I’ll happily stay home, where my heart is. — L.R. Best Korean Comfort Food: Pyeongchang Tofu House. Oakland is blessed with some of the better Korean food in the Bay Area, and if you have a craving for truly delicious, comforting Korean dishes, Pyeongchang Tofu House in Temescal does the trick. There are several soondubu houses along Telegraph Avenue that all specialize in bowls of piping-hot soft tofu stew. 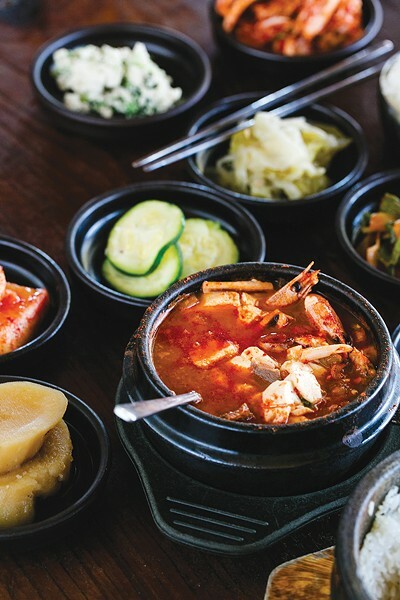 But Pyeongchang distinguishes itself by having some of the best-flavored broth, as well as the tastiest and rarest banchan (small side dishes) you’ll find. The banchan offerings rotate frequently, and sometimes you’ll find treats like crumbly tofu with parsley or super-tart soy-and-vinegar celery to go along with your standard kimchi and sweetened potato. If soondubu isn’t your thing, the restaurant has a wide variety of crowd-pleasers such as bibimbap (which comes in several varieties, e.g. the texturally satisfying sprouts-based version), as well as rarer items like kong gook soo, which is noodles in savory soy milk. But really, the main reason this place excels is that their spicier-level soondubu is actually spicy, much to the delight of local Koreans. — N.C.
Star Grocery might cater to the tony Claremont area of Berkeley, but don’t let that keep you away from Star Meats, the down-to-earth meat and deli counter in back. 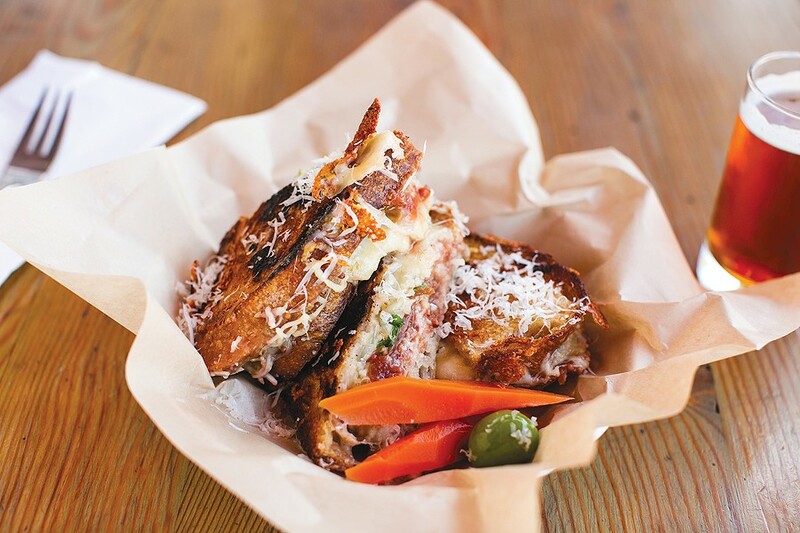 Though the East Bay is known for having sandwiches that are only available during certain hours or certain days of the week, none are quite as fattily delicious and as affordable as the sandwiches here. Your timing has to be right: Star Meats only serves sandwiches from 11 a.m.–2 p.m., and the staff is strict about not serving them before or after that. The bread comes from the next-door La Farine bakery and the meats are all high-quality. Particularly delicious is the Classic, which has ham, salami, and hot coppa, and is topped with fresh veggies and a proprietary spice blend. They don’t go nuts with the mayo here, either, preferring to rely on those spices and the tang of good vinegar. These are oily, messy sandwiches — but totally filling and worthwhile. — N.C. Eating breakfast for dinner is usually a product of laziness, economics, or nostalgia. At Belly, however, choosing the most breakfast-like item on the menu doubles as the best decision possible. The cozy Uptown restaurant specializes in SoCal-style tacos and burritos that burst with Asian flavors. While the breakfast taco in question doesn’t contain kimchi or sambal, it isn’t exactly a traditional egg-chorizo-potato deal either. Thick, tender cubes of steak are marinated Korean bulgogi-style, in a blend of soy sauce, sesame oil, garlic, onion, and scallions, as well as Asian pear for sweetness. The beef is topped with skinny, crispy fries, and everything gets buried under a sunny-side-up egg that seems ready to break at any moment. Upon contact, the yolk oozes into each bite, mingling with the chipotle and garlic aiolis. Get one of these for $4.25 and sample some of Belly’s other fusion tacos, or try steak and eggs in burrito form for $12. — J.B. So many things on the 900 Grayson breakfast and brunch menus are great — the burger, the chicken and waffles, the grits — but I am incapable of going there without ordering a side of hash browns. A flat golden disk the size of a fist, these are like an upscale version of the McDonald’s hash browns. To be clear, that’s a compliment. Perfectly crisp on the outside and tender on the inside, these hash browns make the ideal breakfast side dish — or, depending on how important potatoes are to you, main dish. The only thing that’s too bad is that the hash browns are only on the restaurant’s breakfast menu. They would make a great snack any time of day. — J.G. As if buttermilk fried chicken and cornmeal waffle lovers needed any more incentive to head to West Oakland’s beloved Brown Sugar Kitchen. Now add Golden State Warriors spotting to the list. Yep, this past season so many Dubs — including Stephen Curry, Andre Iguodala, Shaun Livingston, Harrison Barnes, and Festus Ezeli — hung out at BSK that chef-owner and blue-and-gold basketball fan Tanya Holland ordered #StrengthInWaffles T-shirts in the team’s honor. DubNation devotees snapped up these tees riffing on the team’s trademarked slogan #StrengthInNumbers. Holland is convinced that the NBA stars played particularly well after eating her signature dish, served with brown-sugar butter and apple-cider syrup. BSK draws a lot of celebs. This year Drake, Key & Peele, and Tyra Banks have all stopped by. But this is Warriors ground: And staff and diners alike delight when the Golden State boys swing by for Holland’s soul food inspired fare. Call it the breakfast of champions — and comfort food during this long off season. Go Dubs! — S.H. On a quiet corner of Claremont Avenue, the modestly sized Alem’s Coffee efficiently churns out strong coffee and delicious traditional East African breakfast dishes. The limited indoor seating is supplemented by tables and seats along the sidewalk and under a shaded patio frequented by Eritrean expats, locals, and overflow from the farmers’ market and DMV across the street. The patio area, in particular, is characterized by a distinct, languid pace: This is a place where sips of coffee serve as punctuation for long conversations instead of just as a utilitarian morning ritual. For breakfast, Alem’s offers a variety of savory East African dishes including a firfir plate with berbere- and tomato sauce-soaked injera morsels, and shihan phoul, a breakfast staple that consists of crushed fava beans topped with chopped onion, tomato, and jalapeño. Both dishes can be prepared vegan, but for those who favor eggs in the morning, Alem’s scramble pairs particularly well with the firfir. For East African expats, Alem’s offers a temporary cure for nostalgia. For all others, it offers a hearty breakfast from the other side of the world. — R.Ge. Every neighborhood deserves a cafe where you can buy a decent cup of coffee and order a satisfying breakfast — the sort of establishment where locals gather regularly and outsiders make a date to go there. That’s the Sequoia Diner in Oakland’s Laurel District. It’s a down-home, retro diner serving elevated breakfast and lunch staples — a short menu of eggs, potatoes, waffles, salads, and sandwiches that make their mark. Fan here of the Vegetarian Breakfast with sun golds, chickpeas, and mushies, among other dishes. Sequoia makes everything in-house from bacon to biscuits. Husband-and-wife duo Andrew Vennari and Sequoia Broderson are industry veterans: Vennari did stints behind the stoves at Camino and Duende. Broderson worked front-of-house at La Note. Their pedigree shows on the menu and in the service: The couple has created a warm, welcoming spot. Java junkies take note: Highwire Coffee in the house, too. Best enjoyed weekday mornings. — S.H. Sometimes a hot blast of noodle soup first thing in the morning is just what’s required to brace yourself for whatever the world is going to shove in your face later in the day. Hydrating, nourishing, and protein-rich, the Vietnamese tradition of eating noodle soup for breakfast is well worth trying. In Oakland, there’s really no better place for it than Mien Tay, with its beautifully prepared broths, quality cuts of meat, 8 a.m. opening hour, burbling flat-screen TVs, and — last but certainly not least — free WiFi. The pho is better than decent, though perhaps a more interesting choice would be the Vietnamese udon, which is mild of broth and nuanced of texture, adorned with a pork knuckle and thick, translucent mung bean noodles. And on mornings that require you to dig deep for a bit more oomph, the House Special — a bonanza of chili, lime, fish, and pork — will gird you for battle. Get the pre-sweetened, hot Vietnamese coffee for extra zoom. — C.S. You know those days when you finish a big project at 3 p.m. and want to celebrate, but all of your friends are still working? Or you get out of a doctor’s appointment at 3:30, and there’s no point in going back to work for just a few hours? Or the days you “work from home” and have a craving for a cocktail and a snack in the middle of the afternoon? For all of those times and many others, the bar at Wood Tavern is there for you. The restaurant is open but half-empty during those hours between lunch and dinner, the staff is warm and welcoming, and the drinks and snacks are everything you need. Go sit at the bar with a book or a magazine or this very newspaper, order a martini or a cold glass of rosé or a pint of beer to enjoy with the thin and crispy french fries or a cheese plate. Chat (or not) with the friendly bartenders. Celebrate your brilliance at spending your afternoon this way. — J.G. Food-focused happy hours can be hard to find. Look no further than newcomer La Marcha, a West Berkeley tapas bar that offers small-plate lovers bargain bites that don’t fall short on flavor. Better still, chef-owners Sergio Emilio Monleón and Emily Sarlatte host happy hours in both the afternoon (4–6 p.m.) and, rare in these parts, late evening (10 p.m.–midnight) daily, except Monday, when the restaurant is closed. The restaurant provides complimentary tapas with any happy hour beverage purchase of house beer, wine, or sangria. Several of the $2 or $3 happy hour dishes — including the patatas bravas and mushroom croquetas — are standouts worth paying more for. Also delish with a drink: aceitunas (olives with orange zest, sherry vinegar, and pickled garlic) and coca (a flatbread featuring Dijon honey cream, caramelized red onions, manchego, jamón serrano, pears, and candied walnuts.) And, bonus: The young, diverse, friendly front-of-house staff only adds to the happy vibe here. — S.H. Joshu-ya has been a Berkeley staple for more than 40 years, satisfying generations of hungry college kids with delectable California fusion and ample portions. Reborn in 2011 as a more modern “Brasserie,” the restaurant still offers a nice getaway from the hubbub of Telegraph Avenue with its tranquil, fenced-in garden setting. At lunchtime the prices drop precipitously for specials such as the massive “make your own maki” sushi combo, whose size some online reviewers have likened to a small tree sapling. Those who aren’t in the mood for sushi can browse the day’s selection of seasonal tapas, which might include pommes frites, Kobe beef sliders, or black mussels con chorizo. But whether you settle on the hamachi tartare or the slow-roasted pork belly soba, you’re bound to leave with both your stomach and your wallet at ease. — A.B. If you need to plan an office lunch without the hassle, The Town Kitchen — a lunch delivery service that employs low-income Oakland youth — is the move to make. Not only does this Oakland-based company serve fresh, seasonal salads, sandwiches, and wraps, it will hand-deliver any order of ten lunches or more. (For smaller orders, customers can pick up their food at one of the company’s two co-working spaces — one in the Jack London District and the other Uptown.) Pro tip: Don’t miss the crispy potato chips, which are sliced, fried, and seasoned in house. Each box includes an entrée and side, with the option to add a drink and dessert from local food artisans such as Alter Eco and Tart Bakery. As tasty as the food is, let’s not forget that it’s all for a good cause: Not only does The Town Kitchen hires under-served young people, it trains them so they develop transferrable skills that they can use to pursue their future goals. — C.M. There aren’t a lot of settings where board games are considered “cool,” especially if you’re over 20 and sober. But that’s precisely what you’ll find at Berkeley’s Victory Point Cafe, where you can unleash your inner kid and settle old scores with all the board games you could ever dream of. It’s an easy $5 to access to more than eight hundred different games, ranging from the classic to the obscure (Agricola, anyone?). To keep that endless Monopoly round afloat, there’s plenty in the way of drinks — locally-brewed coffee, teas, and fresh lemonade — and snack-time favorites such as hot-pressed paninis, gourmet pretzels, and grilled cheese. Grown-up gamers will appreciate the selection of wine and microbrews. And if you’re stuck on choosing a game, or settling a heated dispute, don’t worry: One of the cafe’s knowledgeable “game gurus” will be on hand, ready to help. — A.B. Best Grilled Cheese that’s Worth the Wait: The Cook and Her Farmer. The first time you order a “slow-cooked grilled cheese” at The Cook and Her Farmer, you may find yourself sitting impatiently, tapping your fingers on the table as your dinner partners happily munch away at their already-delivered food. How unfair, you think, when you ordered before they did. As your friends start scraping their plates, you almost utterly give in to despair — and then, the sandwich finally arrives. It’s crispy, melty, a bit funky, and totally worth every second you waited for it. The gruyère, jack, and pecorino are at different levels of gooeyness and still somehow work together. The fruit mostarda adds acidity and sweetness to offset the salty richness of the cheese. The crunch of the crispy levain bread completes your happiness. You may have waited forever, but some things are worth the pain. — N.C.
Those of us who have grown up in the Bay Area are used to seeing beloved restaurants close, only to see a chain restaurant or a startup move in. Miraculously, Nabolom Bakery, which closed last summer after forty years in Berkeley, reopened this spring with much of the same menu and many of the same staff. Rest assured, the cheese Danishes — always one of the best things on the bakery shelves — are just as good as they used to be, and possibly even better. The rich, buttery dough manages to be both tender and flaky, and it encases a tart and fruity cream-cheese filling that goes perfectly with your coffee at any time of day. There are lots of fancy new bakeries in the East Bay now, and we love their tarts and their kouign-amann too. But sometimes what you really need is an old-fashioned pastry. On those days, go pick up a Danish or two from Nabolom. — J.G. I know, a bagel shop is not the place you’d expect to find the best chocolate chip cookie you’ve ever had, but that’s exactly where you can find it. The chocolate chip cookies at Beauty’s Bagel Shop are the Platonic deal of a chocolate chip cookie. With crisp edges, a perfectly chewy center, layered chunks of half-melted chocolate, and a sprinkle of fleur de sel on top, they have everything we’ve ever wanted in a cookie. It’s not just that the texture is just right. The flavor is rich with butter and high-quality chocolate, and there is just enough salt on top to both add more crunch and to cut the sweetness. Sure, you’re in a bagel store, but I defy you to find a better chocolate chip cookie anywhere. — J.G. For the past decade-plus, people have declared that something (Cronuts, madeleines, kale juice) was the new cupcake. Meanwhile, cupcake shops have quietly continued to open and flourish, because people will always crave and buy portable cakes topped with frosting. James and the Giant Cupcake, a homegrown Oakland cupcake shop, has a wide variety of flavors, all with entertainingly wacky names, but our favorite is the super-lemony and sweet-tart Kurd Cobain. The lemon curd filling and the thin layer of lemon frosting on these lemon-poppyseed cupcakes are the additions that take this cupcake from a bakery counter staple to a drive-across-town-for kind of treat. The shop doesn’t have these every day, so check their online menu before you go, but be warned: You’ll likely get seduced by some of the other flavors when you get there. Fortunately for all of us, James and the Giant Cupcake makes mini versions of most of its cupcakes, so you can try a few without sugar shock. — J.G. While the Taiwanese chain 85C Bakery Cafe is no newcomer to the world of baked goods, its Downtown Berkeley branch has been delivering sweet and savory treats to East Bay customers for just under a year. In that time span, however, it has quickly become a local favorite, especially with Berkeley students looking to study in the spacious two-story cafe space and snack on some delicious — and affordable — pastries. 85C’s self-serve displays show off the shop’s wide variety of European-, Taiwanese-, and Japanese-inspired baked goods. From fan favorites like the famous fluffy brioche loaf to an assortment of soft and puffy toasts, 85C is more than equipped to satisfy anyone with a carb-hungry sweet tooth. More adventurous bread enthusiasts can try the “calamari stick” — a misleading name for the round, puffy black bun, which is flavored with squid ink and stuffed with mozzarella cheese. Or make a meal out of your bakery binge: Grab a savory cheese-dog bun and a sweet milk-pudding-filled bread for dessert, then wash everything down with a salty-sweet sea salt mountain green tea. And make sure to keep your ears open for the 85C staff’s hollers of “fresh bread!” to be the first to get your hands on a pan of freshly baked goodness. — R.A. When budget cuts threatened to wipe out cooking and gardening classes at Willard Middle School, veteran garden teacher Matt Tsang hatched a plan. What if students helped fund their own elective by preparing meals for sale to school families and community supporters? With online ordering and tracking assistance via dinner-sharing startup Josephine, Growing Leaders debuted in 2014. On production weeks, students process, prep, cook, package, and distribute meals. Non-production weeks are devoted to recipe research, business development, and social-media marketing. The meal service has been a hit since it started and will return this fall. Popular items include chicken pot pie and chicken curry (basically anything with chicken). The student-selected menus span the globe, though. Empanadas, gumbo, pozole, and African chickpea stew have been featured, reflecting the school’s diverse student body. The $11 meals come with an organic garden salad; customers can also order add-ons like cake. Worthy cause aside, this is also a meal service: The grub needs to taste good or customers will go elsewhere. No worries on that score. These in-demand dinners routinely sell out. — S.H. In the mood for vanilla or a classic stracciatella? How about rose, lemon cream, or even toasted garlic? Located just a stone’s throw from the Downtown Berkeley BART station, Almare Gelato has you covered, with its healthy heaping of both traditional gelato flavors and less-typical specials such as white-chocolate orange and toasted almond with caramelized figs. Owner Alberto Malvestio has tinkered with all permutations of the icy treat since he opened his shop in 2008, bringing the craft of his gelato-chef father with him from Northern Italy. Simone Arpaio, who runs the store with Malvestio, explained that Almare’s gelato is always rooted in Italian tradition. But some of the more ingenious flavors were inspired closer to home — for instance, a rose-and-custard combination that was suggested by one customer. The flavor lineup changes each day, but you’d be hard-pressed to find an authentic Italian experience that’s so accommodating to gelato eaters of all preferences. “People that come from different parts of the world come with different taste,” Arpaio said. “And in Berkeley there are lots of these people.” — A.B. It’s possible to have too much of a good thing — unless that good thing is chocolate. A favorite of the Berkeley Chocolate Club (a group of local chocolate enthusiasts), Rockridge’s Bittersweet Cafe boasts the East Bay’s finest drinkable chocolates, with a rich, thick texture that places them in a class above your average cocoa. Choose from more than half-dozen incarnations, such as the buttery Salted Caramel or the lighter White Chocolate Dream, which boasts notes of cardamom, cinnamon, and nutmeg. The shop’s signature drink is the Bittersweet, with its citrusy tinge, but each drink can be customized to account for personal taste, or to make it vegan-friendly or gluten-free. The cafe’s rustic setting, with its poster collages and mismatched wooden chairs, makes this a must-visit for rainy-day study sessions and indulgent chocolate binges. An added bonus: Mixes of the Bittersweet, Classic, and Mocha flavors are available for those who prefer to enjoy their drinking chocolate from the comfort of their own home. — A.B. For vegans who feel they’ve shackled themselves to a mono diet of gluten and nutritional yeast, Taqueria La Venganza is something of a savior. The Wednesday night pop-up at Berkeley’s The Butcher’s Son makes dignified renditions of Mexican favorites that evoke enough street, enough heat, and enough masa-y goodness to take the edge off of any Fruitvale taco truck withdrawals a recently converted vegan might have. The masa is fresh and delicate, the salsa is vibrant, and there’s nary a sight of weird gluten meat substitutes. Instead, chef Raul Medina skips the pretense of meat altogether in favor of yuba given long treatments of liquid smoke and spices to evoke the flavors of carnitas. Beer and lime convert thicker yuba slices into carne asada-esque delight. Fear not, you healthy vegans you: You might still find it difficult to get your regular dose of vitamin B12, but not so difficult to get your dose of fun. — C.S. Sweet, sour, spicy, crunchy, addictive: None of those are words that I ever thought I would use to describe cauliflower until I had this dish at Juhu Beach Club. An Indian-Chinese specialty, the dish involves cauliflower florets that are deep-fried and tossed in a sweet, hot, tangy sauce. The edges of the cauliflower feel almost caramelized, but each piece manages to be cooked perfectly all the way through. Every bite makes you want just one more bite. If I could buy a big tub of this cauliflower before going to the movies and eat it instead of popcorn, I would do it — that’s how great this cauliflower is. Juhu Beach Club’s menu is built for sharing, but when it comes to the Manchurian Cauliflower, I strongly advise you to get at least one order per person. Trust me on this. — J.G. 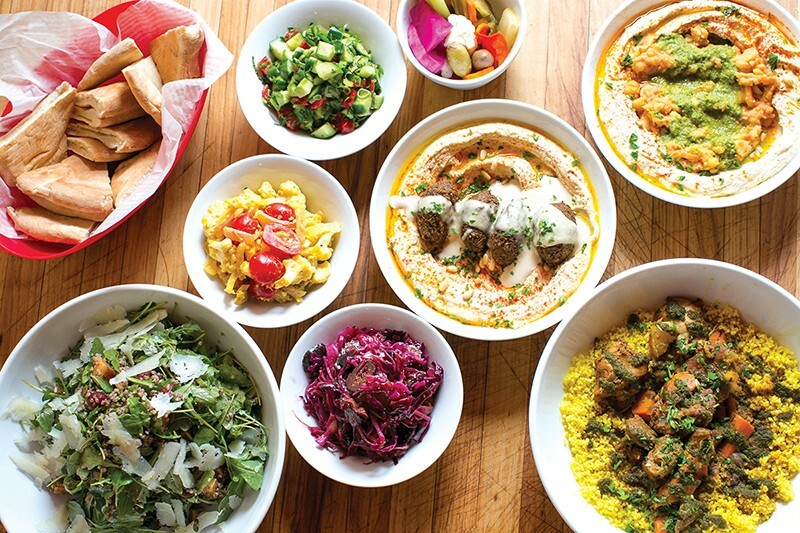 Ba-Bite is just what the East Bay restaurant scene has been missing: a fast-casual spot loaded with local, organic produce and Middle Eastern flavors. Meat’s on the menu, sure, but what really gets me going are the mezze plates — small, impeccably assembled little salads in a panoply of flavors. The sun-colored, crisp-tender cauliflower salad is citrusy and exquisitely perfumed with saffron; the salad shirazi of cucumber and tomatoes can seem addictive; and the hummus here is an “always” food: earthy, creamy, kissed with fruity olive oil. The place screams of health, but also of luxury — a luxuriousness evoked by deft combinations of herbs and spices, and the clean taste of fresh vegetables. — C.S. In Oakland’s new era of foodie culture and fancy restaurants, cocktail lists tend to read like a chemistry quiz that you forgot to study for. Trying to decipher exactly what a cocktail will taste like can be a challenge — what is Suze? What is pineapple gomme? What is sotol? Of course, it doesn’t help when you’re looking at a $12 price tag and an overworked bartender. That’s why I recommend signing up for Alchemy’s weekend tasting events. Almost every Saturday afternoon, some new liquor purveyor is on hand at this Grand Lake neighborhood bottle shop, giving participants a chance to sample the goods. These educational tastings are a good way to meet the distillers, chat with other cocktail enthusiasts, and peruse shelves filled with strange ingredients that will inevitably find their way into tonight’s cocktail. The best part? The tastings are totally free. So, if you’re looking to beef up your knowledge of spirits and liqueurs to impress your bartender or a future date, look no further. — P.R. 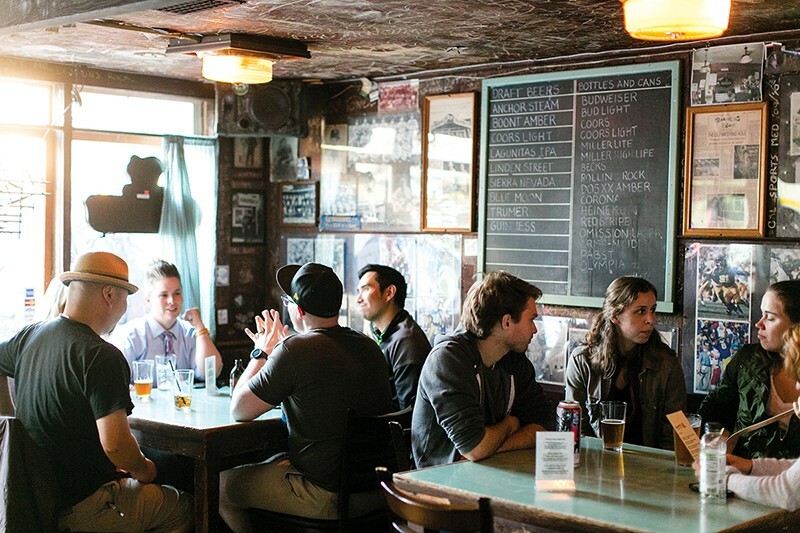 Best Dive Bar with an Address Change: The Kingfish Pub & Cafe. During an era when many of our favorite tried-and-true Oakland establishments are succumbing to the financial pressures of rising rents, gentrification, and cutthroat competition, the Kingfish — a dive bar set in a former bait shop in Oakland’s Temescal neighborhood — has dodged the bullet of permanent closure. When the land where the bar was situated was slated for a condo development, locals and regulars bemoaned the potential loss of their favorite neighborhood dive. But fear not! Rather than razing the Kingfish, its owners lifted it up (literally) and plopped it down across the street. The bar remains just as wonderful as it always was, with its shuffleboard table and the game always on — plus an expanded backyard. So, grab a couple beers and come enjoy Oakland’s newly relocated old bar. — P.R. Nigel Jones and Adrian Henderson turned their popular Jamaican pop-up into a full-blown brick-and-mortar restaurant in 2013. It has a lot to offer: slow-smoked jerk chicken, tender braised oxtails, and live reggae. But what Kingston 11’s owners have dubbed the “Fern Gully Rum Bar” might be the restaurant’s biggest highlight. Named after a scenic area on the island, the bar features cocktails made with Jamaican ingredients such as hibiscus, Ting (a popular grapefruit soda), and the restaurant’s home-brew ginger beer, which is fermented in-house with ginger, pineapple, and various spices. The ginger beer is plenty powerful on its own, but it’s also the star of the restaurant’s version of a Dark and Stormy cocktail, along with a generous pour of Gosling’s rum and a splash of lime juice. The result is one boozy drink, with a kick that’s downright unforgettable. — C.M. Sake Gumi isn’t just any drinking club. You won’t find a bunch of bros sitting around pounding brews or old men in suits sipping Scotch. Like everything that Umami Mart presents, it’s tasteful, refined, and entirely Japan inspired. The Japanese import store in Old Oakland is likely the country’s only Japanese beer shop, and it also sells a huge selection of imported and stateside sake. But for those who would rather consume in a social — and educational — setting, Umami launched Sake Gumi last summer. Subscribers to the club ($29 a month) receive two 10-ounce bottles of sake every month along with pairing suggestions and tasting notes, as well as educational tidbits about the nuances of sake culture. (For $75 a month, premium members get rarer sakes in 24-ounce bottles.) But the best part of Sake Gumi is the field trips, for which Umami owners Kayoko Akabori and Yoko Kumano plan events at places like Ramen Shop, where they serve special sake cocktails paired with Japanese appetizers such as melt-in-your mouth tonkatsu fritters. — S.B. The cocktail menu at Drexl is always on point. But if you’re a seasoned drinker who likes to venture off into uncharted territory, then Drexl really is your kind of bar — and Monday night is the night to go. Just ask Alex, the friendly bartender, to whip up something special for the $8 drink deal. Ask for a vesper, and you’ll wind up drinking his twist on the classic cocktail with celery bitters, Suze liqueur, and lemongrass brandy — he’s not afraid to use any of the strange ingredients that you’ll find behind the bar. Order a gimlet, and he might make it with chamomile liqueur and locally made terroir gin. So if you’re in the mood to try something new and have your mind blown by a drink in a glass, throw caution to the wind and spend a Monday night getting drunk at Drexl. — P.R. Wandering through the aisles of Trader Joe’s is enough to work up a thirst, especially if it’s followed by an hour of slogging through Ross Dress for Less or shopping for books at Barnes & Noble. Luckily, if you happen to run your errands at El Cerrito Plaza, Mel-O-Dee is there for you — a dark bar just waiting for you to dive in. With its good booze selection, signature red-patterned wallpaper, big tables and booths in the back, and ample dance floor, Mel-O-Dee is a good place to let loose and throw back a couple tequila sodas or PBRs. Fridays and Saturdays are karaoke nights, and there’s always plenty of parking. Or, if you’re being responsible and not driving, Mel-O-Dee is only a three-minute walk from the El Cerrito Plaza BART station. — P.R. When I want a cocktail on a hot Oakland evening, this is what I want: something fizzy and tart with a hint of sweetness — something that packs a punch, but is refreshing enough that I can sip it for hours. The El Pepino at À Côté is all of this and more. One of the restaurant’s signature cocktails (even though it’s no longer listed on the frequently updated cocktail menu), this drink has gin, muddled cucumber, and lime. Every time I get one, the first sip makes me wonder why I’ve bothered drinking anything else. These cocktails go as perfectly with the plate of frites eaten at À Côté’s dimly lit bar as they do with the salad and flatbread enjoyed while sitting on the spacious back patio. If you drink too many of these, you’ll stumble home, but it will be with a smile on your face. — J.G. Pizzaiolo has an extensive wine list, a small but carefully assembled cocktail list, and a full bar. So why is it that I order a gin and tonic at least half the time? Because the house-made tonic at Pizzaiolo (which can also be found at its sister restaurant, Boot and Shoe Service on Grand Ave.) is just that good. Logically, anyone should realize that the ingredient that makes up the bulk of a cocktail will make a big difference in the taste of the drink. But you’re never as aware of that as when drinking any cocktail with Pizziaolo’s house-made tonic. It elevates a normal everyday drink to a special occasion one, and makes you bless whoever first decided to add quinine to fizzy water and then pair it with gin. You can (and I do) buy fancy tonics at the grocery store and make a high quality gin and tonic at home. But the house-made tonic from the Pizzaiolo crew is better than any store-bought tonic we’ve ever had. — J.G. Tasting menus aren’t for everyone. Even when it’s executed brilliantly, the long-format menu that now dominates the Western fine-dining world — a procession of fifteen or twenty tiny dishes served over the course of three hours — simply might not be your cup of tea. Enter Delage, an Old Oakland sushi restaurant that draws from an older tasting-menu tradition: omakase — a fixed-price sushi meal in which the chef serves a sequence of whatever dishes he or she likes. Make no mistake: the $65, eight-course omakase at Delage is one of the best deals around. The traditional nigiri, served in two separate courses, is the best in the city — the fish pristine, the knife-work flawless, the rice unimpeachable. But what I love about the omakase at Delage is how the nigiri courses are interspersed with non-sushi dishes — say, a chilled asparagus soup, or a confit cherry tomato salad, or fresh baby corn prepared in the manner of Mexican elote — that help keep the meal refreshing and, just as importantly, fun. In contrast to most Western-style tasting menus, there aren’t a ton of meat dishes in the mix, but what meat there is — the single slice of high-grade Miyazaki beef, for instance — keeps pace with the rest of the Delage experience. It’s pretty much perfect. — L.T. When conversation turns toward banquets, the first thing that comes to mind might be a glitzy hotel ballroom or a $600-a-table, formal Chinese meal centered on luxury ingredients like abalone. That’s all well and good, but here in Oakland, we’re lucky to be able to indulge in a more everyday kind of banquet — a BYOB Burmese banquet served in a casual setting, amid mismatched tables and repurposed church pews. All you have to do is round up a group of eight or more hungry friends and call ahead to give Grocery Cafe at least one day’s notice. A modest $25 a person will buy you a feast. The meal typically starts with a trio of appetizers from the regular menu — delicate fried quail, fermented tea leaf salad, and what are almost certainly the best samusas in the Bay Area. There might be lamb curry or braised oxtails — saucy dishes that are perfect with a bowl of tea-leaf fried rice. If you request it in advance, there might even be a whole catfish. One thing’s for certain: As with any proper banquet, the food will keep coming out, one generous family-style dish after the other, long after you expect it to stop. — L.T. Best Place to Feast on Dungeness Crab on the Cheap: Bay Fung Tong Seafood House. Dungeness crabs are one of the West Coast’s great treasures, and historically, the tasty crustaceans have always been a populist treat, accessible even to us working-class stiffs. There’s good reason to pay more if you can afford it — those fishermen need to make a living! But you’re not alone if paying $30 or $40 for half a grilled crab just isn’t within your budget. Thankfully, downtown Oakland has Bay Fung Tong, where, though the prices fluctuate with the market, you can often snag a large, meaty Dungeness for around $20. 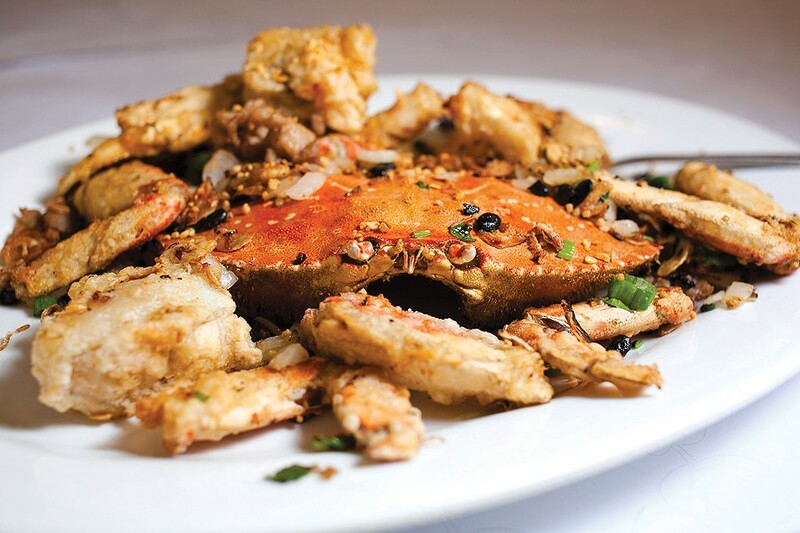 The restaurant serves the crab in all of the typical Cantonese preparations — stir-fried with ginger and scallions or deep-fried and coated in a sauce made with salted egg yolks. But the signature dish is the “Bay Fung Tong Style” crab, which is prepared in a manner typical of what you’d find at a certain kind of floating restaurant that thrived in Hong Kong’s typhoon shelters during the Sixties and Seventies. This is a batter-fried crab, cut into segments and buried under a pile of crispy garlic, sliced jalapeños, fermented black beans, and, for a surf ’n’ turf effect, some kind of pork sausage. As with most Chinese dishes, the crab is meant to be shared — but you certainly won’t regret ordering one all for yourself. — L.T. Many people let out sighs of despair when Justin Hafen and John Hurley announced two years ago that they were closing Marzano, which subsequently transformed into a short-lived gastropub. But a quick Brexit of that concept allowed two former Marzano employees, Manna Tekie and Rob Holt (the original chef) to step in and restore the Italian restaurant to its former glory. The new Marzano is indistinguishable from the old one, save for the absence of the still-to-come lunch service. Most importantly, the menu retains all of the regulars’ old favorites, such as the chicken all’arrabiata, which is braised in the wood oven just as it was before. The pizzas are as solid as ever and can still be accompanied by the addictive house-made Calabrian chili oil. The new owners also put the restaurant’s Ferrari-logo-inspired sign back up for the whole neighborhood to see. — N.C.
Once considered the most dangerous city in the Bay Area, Richmond is now being touted as the shiny new destination where all the broke young hipsters will move to next. Mostly, this is pretty strange because if you ask these urban homesteaders what draws them to Richmond, they’ll generally answer, “because it’s close to BART and cheap.” You’d think that if someone is moving to Richmond, it would be because they have a deep appreciation for the city’s culture, which is wild and includes some of the best Mexican food in the Bay. Longtime residents know that Portumex is a quintessential Richmond establishment. Located on a stretch of 23rd Street that’s lined with great Mexican eateries, this is one of those places where you can get a beer and a plate of enchiladas, a whole fried fish, or chiles relleños — plus rice, beans, and salad — for a very reasonable price. There are no $17 tacos here; this is a family-run business that served the local community for years. Pro tip: Sometimes there is a churro truck across the street that sells six churros for $5. — P.R. This popular Lake Merritt area brunch spot isn’t the most obviously Jewish eatery (though the restaurant’s annual Passover dinners are always a hot ticket). And, goy writer that I am, I’m hesitant to make broad pronouncements about a cuisine and culture I’ve mostly followed from a distance. And yet: Grand Lake Kitchen’s matzo ball soup might be the most delicious I’ve ever tasted. Start with the matzo balls themselves, which, if you can pardon the cliché, really are cloud-like, but are also infused with a richness that comes from the generous application of schmaltz (aka chicken fat). No less rich is the broth, which takes two days to make and owes its savory, intensely chicken-y flavor to the use of slow-roasted bones. Topped with a sprinkle of fresh dill, it’s a solid contender for the title of best chicken soup in town, period. Don’t worry, you hipster haters, this isn’t some newfangled, California fusion kind of recipe. If you were lucky enough to have a Bubbe who made you matzo ball soup on those gloomy, rainy days when you felt a little bit under the weather: This is precisely the matzo ball soup that she would have made. — L.T. If my new acupuncturist wasn’t located just down the street, I never would have stumbled upon this neighborhood gem in an unlikely location. And that would have been a shame. Husband-and-wife owners Peter and Melissa Swanson have the requisite Bay Area pedigree to run a Cal-Italian restaurant. Think Oliveto, Dopo, Chez Panisse. And their wood-fired pizzas and simple salads don’t disappoint: Benchmark Pizzeria is homey enough to bear repeating and elevated enough to tempt the taste buds. These are rustic dishes, including pies with a pleasantly chewy, crispy crust and seasonal toppings, as well as house regulars like the anchovy and Castelvetrano olive offering. Pastas are similarly repeat-worthy: A clam dish was a delicious balm one dreary night. And ignore or listen to Express food critic Luke Tsai, who maintains this is “not a bad choice to bring your side piece,” as you see fit. Luke! For the record: It’s a kid-friendly setting where all comers are welcome. — S.H. I’m no ramen expert. But I recognize a delicious bowl of broth brimming with umami when I sip one. Forget the hype around local ramen joints, Iyasare gets my vote for the most slurp-worthy noodle soup around. On the restaurant’s lunch menu, chef Shotaro Kamio, formerly of Yoshi’s and Ozumo, carries on a family tradition: Clearly he learned a thing or two growing up in northeastern Japan at his parents’ ramen shop. We’re talking layers of flavor, seasonings, and ingredients that can lift even the most persistent fog-induced Bay blues. Choose from Sendai Miso Ramen with minced chicken in a chicken and dashi miso broth, Charshu Miso Ramen with tamari braised pork belly (in that same miso broth), or the Vegetarian Shoyu Ramen in a tamari and soy broth. This is no time to skimp: Add the seasoned soft-boiled egg for extra indulgence.These bowls are the bomb. Beautifully presented, they’re best enjoyed outside — under the heat lamp, if necessary. Iyasare means “to be healed.” The restaurant’s vibrant ramen gets the nod for providing nourishment that tastes so good. — S.H. It has been years now since pork belly — decadent, fat-streaked pork belly — became the pet ingredient for everyone from food truck entrepreneurs to fine-dining chefs. But the most addictive pork belly dish in the East Bay isn’t found at one of the region’s usual temples of high gastronomy. Instead, you’ll have to head out to a small commercial strip in San Leandro, where this small, family-run Filipino restaurant dishes out all manner of porky goodness — from the soul-restorative pig’s blood stew known as dinuguan to the funky, shrimp paste-enrobed crispy binagoongang. But Parekoy Lutong Pinoy’s best pork dish of all is its pork sisig: pieces of fried, skin-on pork belly served sizzling and steaming on a hot stone plate, with a raw egg yolk that the cook cracks on top right before bringing it to your table. This is everything you want in a pork belly dish: outrageously crunchy and rich, but also incredibly tender, with none of the dryness and stringiness that you often get with deep-fried meats. What was it that Jay Z said? All I need in this life of sin is this sisig and a bowl of rice. — L.T. Oakland’s vibrant Mexican food scene has no shortage of excellent tamales — steamed bundles of goodness that might have dense masa or masa that’s light and fluffy; tamales that are enriched with lard or prepared Oaxacan-style, with mole as the primary filling. What you hear about less often are Salvadoran-style tamales, which, in Oakland, you can buy at El Sabrosito, a newish food truck known mostly for its pupusas. But once you try the chicken tamales, you’ll be hard-pressed to ever order anything else. In keeping with the Salvadoran style, these are steamed in banana leaves rather than cornhusks, and so they have their own particular fragrance. Instead of just a few pieces of chicken or pork, the filling is a full-on stew — tender and juicy, studded with soft-cooked potatoes and green beans. The best part, however, is the masa, which is so tender that it quivers and jiggles at the slightest touch — a texture closer to panna cotta than any other tamal we’ve eaten. — L.T. It turns out there isn’t one particular secret to the best pasta in the East Bay, which you’ll find at Belotti, a sleek restaurant in Rockridge that specializes in the cuisine of Northern Italy. There’s the fact that chef Michele Belotti uses about twice as many eggs as you would in a basic pasta recipe, and only uses the yolks — yielding a thinner and more richly flavored final product. There’s the Trapani sea salt that Belotti seasons the cooking water with, which he swears is essential for giving the pasta the proper flavor. There’s the fact that Belotti personally makes every batch of dough himself. The end results speak for themselves. Whether you order the decadently meat-stuffed, brown-butter-glistened casoncelli, or the simple and elegant spaghetti with burrata, or any of the other fresh pasta dishes on the menu, you will marvel at how wonderful the texture is — how tender, toothsome, and delicate. — L.T. Best Grilled Chicken, in Taco Form: La Selva Taqueria. The most idiosyncratic spot on Richmond’s bustling 23rd Street taco corridor has a rainforest and safari theme to its decor (a panther stalking you from atop the salsa bar) and the kind of casual vibe that, during a recent visit, included a teenager hawking bootleg DVDs to lunch patrons. 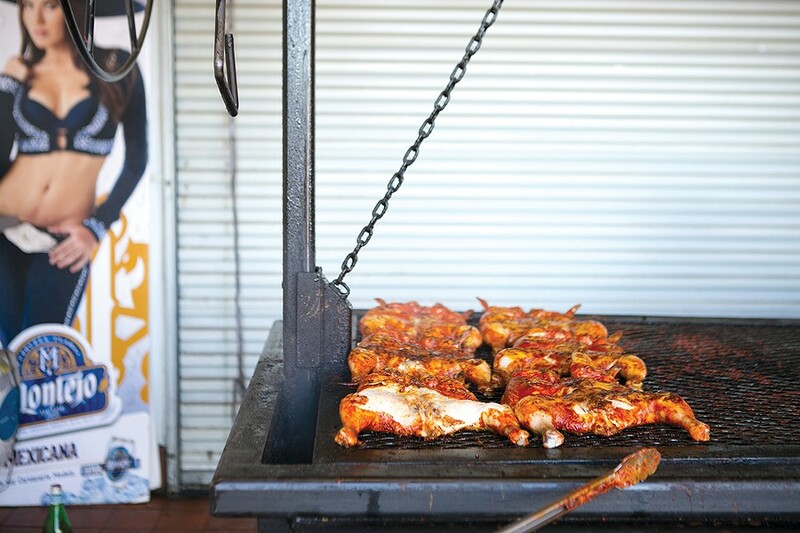 What’s most notable at La Selva, though, is the specialty of the house: a row of whole spatchcocked chickens that are grilled over charcoal in a little garage adjacent to the restaurant. Perhaps you’re familiar with the fast food chain El Pollo Loco, which also specializes in “fire-grilled” chicken? The only difference is that the food at La Selva is about a hundred times better — the tangy, addictive heat of the house-made salsa; the intoxicating smell of the meat charring on the grill; and, oh God, that chicken, which is smokier and more full-flavored than just about any other “grilled chicken” you’ll find on a restaurant menu. Or your tacos a la carte — the al pastor is also topnotch — or order a whole or half-chicken if you enjoy the El Pollo Loco-style build-your-own-taco format. — L.T. The Oakland Food Policy Council was founded in 2009 to gather and leverage community power in finding solutions for food-related problems in Oakland. The 21 council members meet each month to discuss issues connected to four policy focus areas (economic security and development, food access, local and sustainable food procurement, and urban agriculture). These aren’t just abstract conversations: You can count among OFPC’s victories last fall’s Wine Soul Train, a daylong tour of Black- and Latino-owned wineries that the council organized in response to a group of mostly black women being kicked off a Napa Valley wine tour for laughing too loudly. OFPC also offers useful online resources, including Cultivating Resistance, an urban agriculture toolkit that covers city and state laws. Under new directorship from Shaniece Alexander, the council’s next goal is a collaboration with the Oakland Planning Department to expand the city’s Mobile Food Vending Initiative. The council is recruiting new members this summer, but even if you aren’t ready to make that level of commitment, you can still get involved: Meetings — held every third Thursday from 5–7 p.m. on the fifth floor at 1000 Broadway — are open to the public. — R.Ge.